If you want to stun your audience with your sparkling, bold costume or wow your date when you step out in a flowing, sequined masterpiece of a dress, you’ll want to read on. Because Cabaret Sequins Stretch Mesh Fabric will accomplish either goal. This fabric boasts a pattern of carefully chosen curved and elongated shapes composed of sequins on a mesh backing. You have more than 15 colors to choose from, with different sequin to mesh color combinations. Some examples are silver on black mesh, for a striking look, or royal blue for a gentler, brighter outcome. Any dress made of this fabric is sure to be remarkable and beautiful. You can also use this fabric to make a fancy skirt, or even a handbag! Don’t limit yourself! 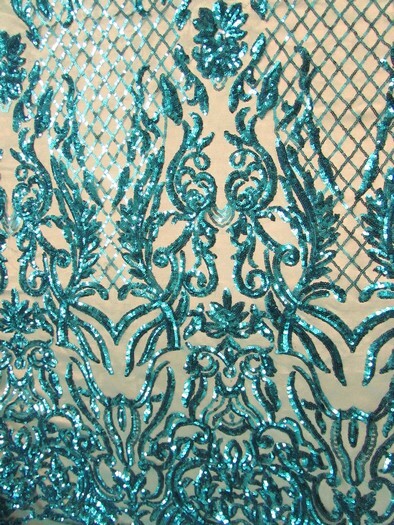 Cabaret Sequins Stretch Mesh Fabric is made of polyester and has a two-way stretch to improve comfort. The width of the fabric is 55/59 inches. You can own this shimmering cloth for $28.99 per yard. Samples are $1. Let your next project be stunning with this incredible option! This entry was posted in Nylon Sequins Fabric. Bookmark the permalink.